Here are some pictures of the Completed V-dory. I launched her in October of 2003 and I love the boat. 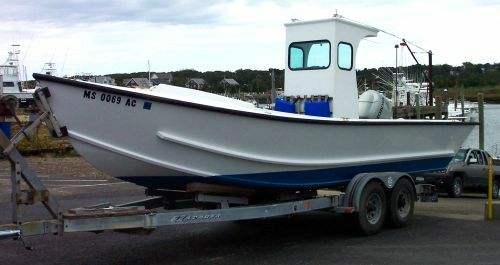 It's put away for the winter now but I will use it for commercial fishing for Striped Bass, Fluke and Tuna as well as tending my Aquaculture grant here in Massachusetts. I added an extra frame to the boat so she's 25' long overall. I also installed deck beams under the cockpit sole and put scuppers in the transom to make the boat self bailing. The hull is covered with 2 layers of 6 oz. cloth and epoxy resin on the outside. I covered the foredeck, rails and inside of the cockpit with fiberglass mat and polyester resin and then gelcoated it for durability and ease of maintenance. The boat is powered with a 90 H.P. Honda outboard and tops out at 25 kts. 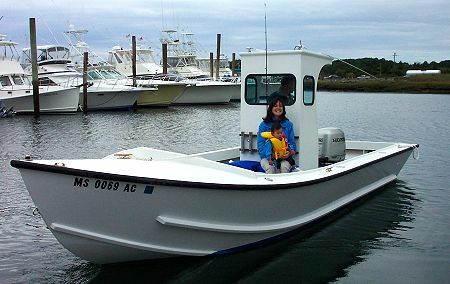 The wheelhouse is my own design but it is a common type found on many center console type workboats around here. The boat is solid, stable and seaworthy and it turned quite a few heads the day I launched her. Thanks for the great plans and I hope to someday build another one.